Energy diagram is widely used in the field of physics and chemistry to depict energy changes. 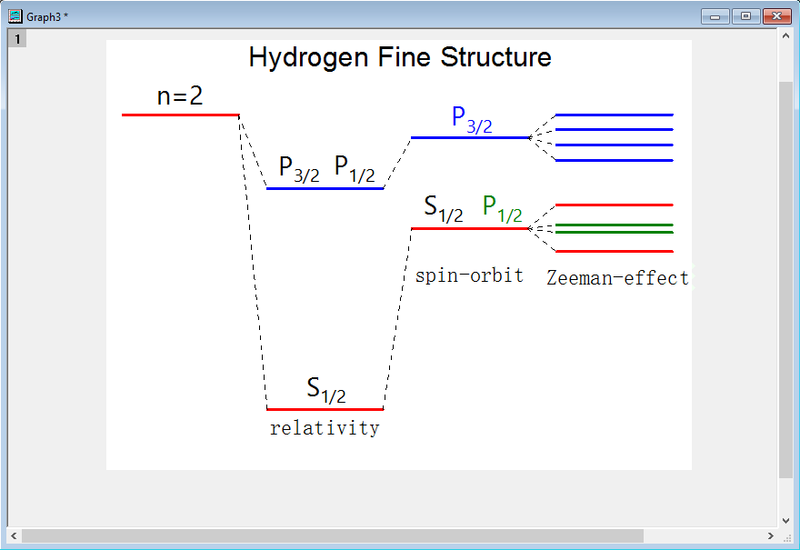 The following graph shows the energy splitting of Hydrogen molecule caused by various physics interactions. We will show in this blog the steps to generate such graph in Origin. Please also download the attached zip file to see the final result. Note: To make energy diagram you need Origin version 2017 SR1 or later. We presume that the data of energy is initially organized as below. Each column corresponds to the energy levels of Hydrogen under each physics effect. When no effect is considered, energy is a constant of 10 (col(B)). While after all effects are taken into account, the energy is split into 8 levels displayed in col(E). The worksheet should look as following. 4. 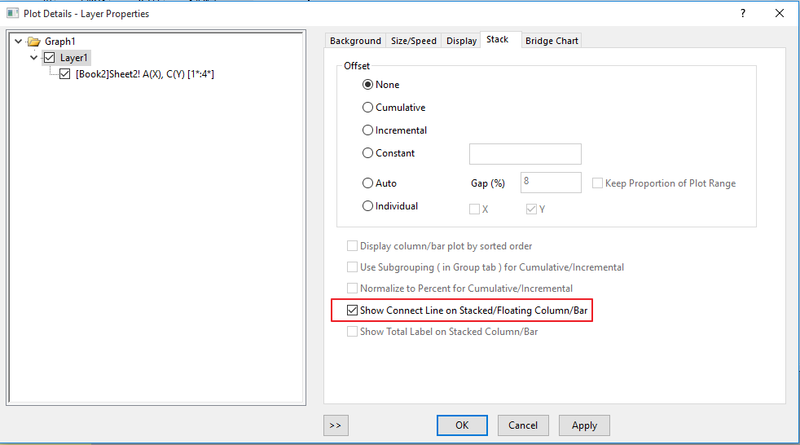 Highlight Col(B) and Col(C), select from menu Plot:Bar:Floating Columns to generate the plot. 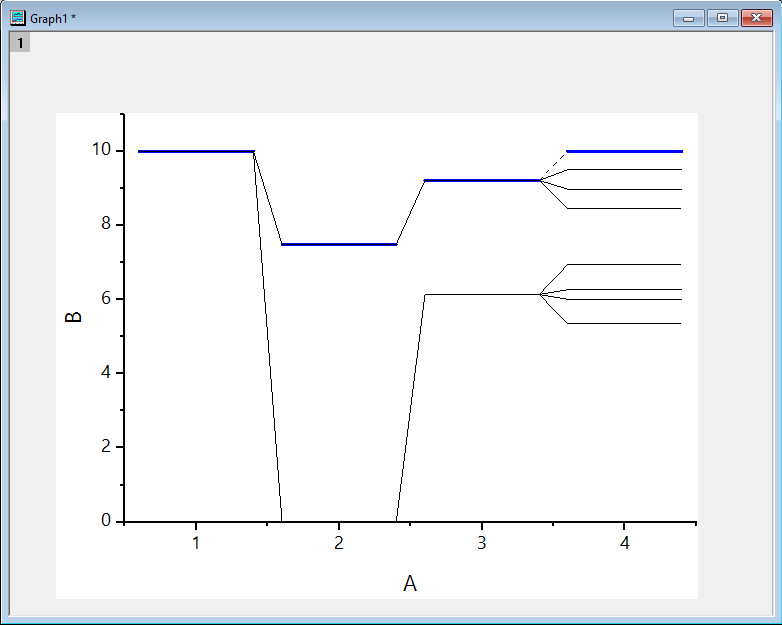 With the graph page active, select menu Window:Script Window, run Labtalk Script page.BarShowZero = 1 to show the level lines. 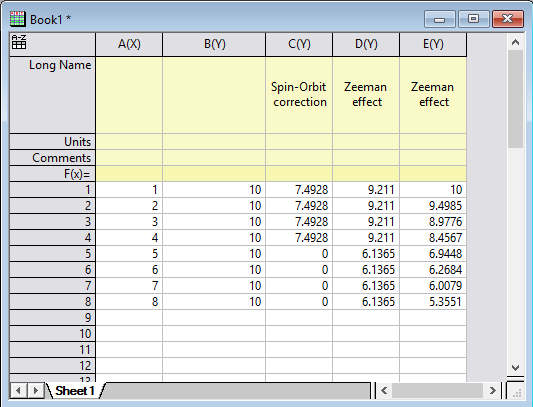 Notice here how we utilize the floating column plot to plot the energy levels. Since the start and end y value of each floating column is the same, each column appears as a horizontal line. 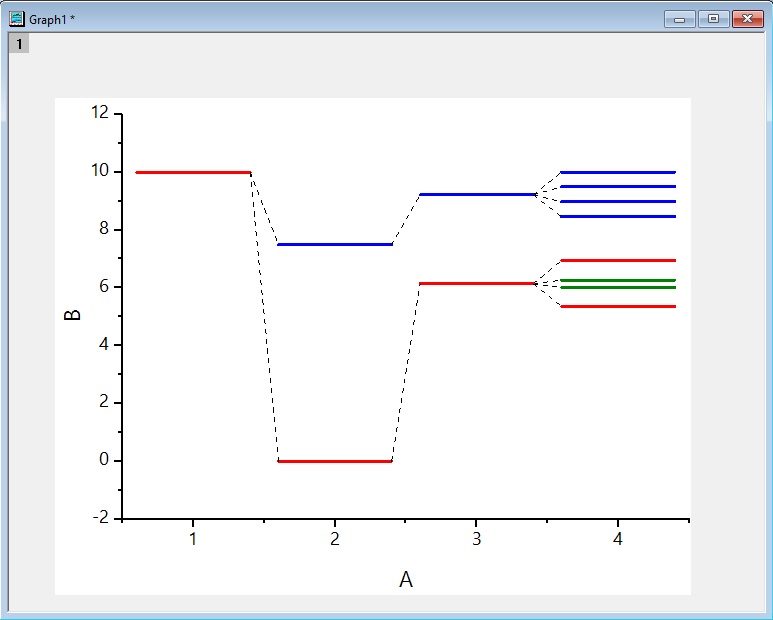 It is necessary to run the above Labtalk script to show the horizontal lines. This setting can also be set globally. 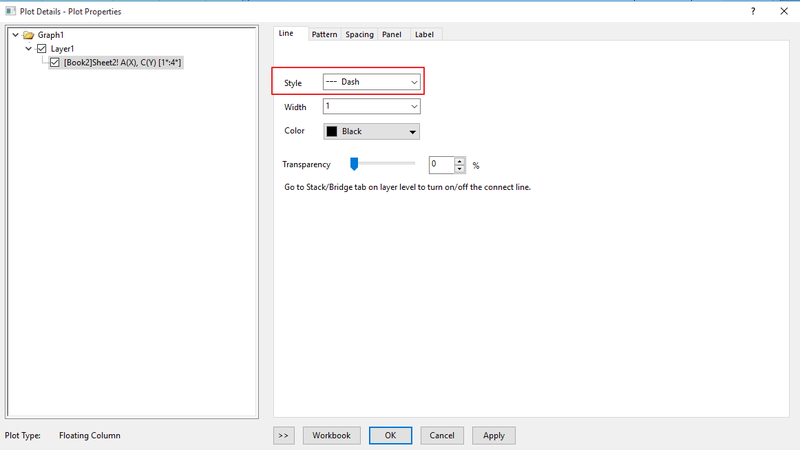 Select menu Tools:Options… , switch to Graph tab and check the checkbox Bar Graph Show Zero Values (New checkbox in Origin 2017 Sr1). 6. Now we add other energy levels into the graph. Highlight col(D) and col(E), move the cursor to the edge of the selected area, hold down mouse and drag&drop the two columns into the graph to add it. 8. Now we want to apply the format of the first plot to all other plots. 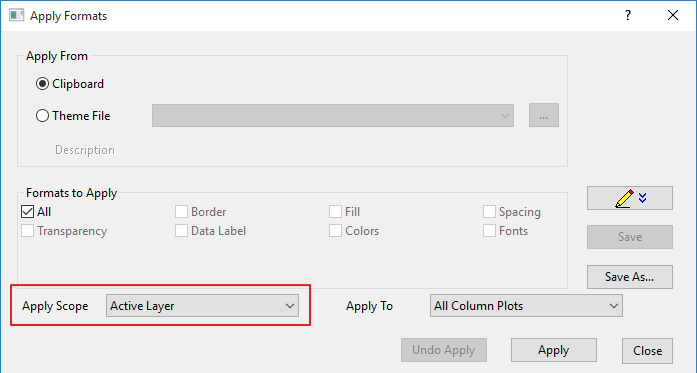 Select the first plot, right click on it and in the context menu, choose Copy Format. 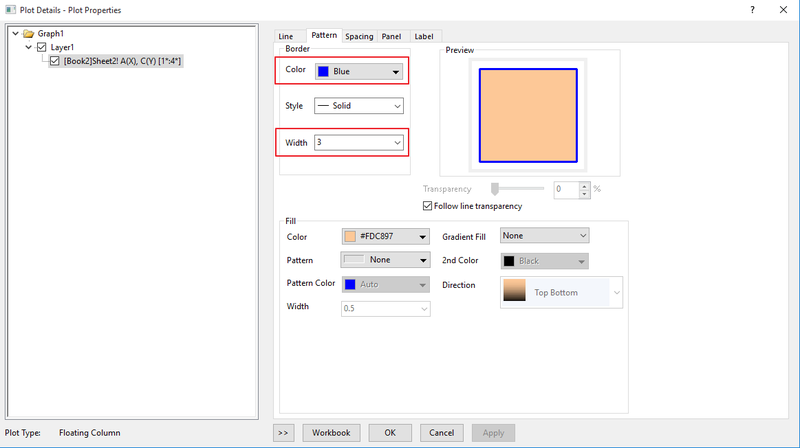 Select menu Edit: Paste Format(Advanced)…. In the dialog, select Active Layer in the dropdown list of Apply Scope. Click Appy. 10. Finalize the graph by adding text and removing unwanted axes.